While it doesn’t look or feel great, sometimes you have to own up to sleeping on someone’s message. Maybe it’s a professional contact you can’t afford to leave feeling forgotten, or a simple case of procrastination that’s gradually snowballed into full-on dread. Whatever the cause, we have some ideas for ways to break the silence and apologize for a late reply. Does a slow response invariably require you to be sorry? If you work in a fast-breaking, deadline-driven profession, you routinely email people back instantly. But that’s not always a realistic expectation, particularly when what’s at stake is the opposite of urgent. Being human doesn’t always necessitate an apology. Say you get an email along the lines of “Hey friendly contact, could we meet up for coffee next week and free-associate about our industry?” While connections like this can be valuable, they probably won’t wither if you take a couple decadently unhurried days to respond. Make clear that you do, in fact, care about responding late. Not everything that lands in your inbox requires a reply, like, ever. Seriously. Sometimes though, even if it’s not essential, a laggy response is better than none at all. Thank you so much for your thoughtful note last month! Also, my apologies for the slow reply; transitioning into this new role has been a little overwhelming, but I’m excited. That last part intentionally turns the interest back toward the person who wrote to you, since they took the time send their congratulations. After all, you don’t want your message back to read as wholly self-involved and oblivious, right? Better late than never, we hope? Sorry for the delayed response. It took some time to find the reports you requested to compare against last year’s data, and your message got lost in the shuffle for a few days. I’m now attaching both documents as PDFs. Also, our marketing director has been on the road, but if you like, I can schedule a conversation with him after he gets back tomorrow. Please let me know if that works, or if there’s anything else I can do to be helpful going forward. Again, you’re owning the delay up front and getting the apology out of the way, then establishing that “indifferent relaxer” is not your default mode at work. It’s no fun to be the bearer of bad news, and worse still to do it slowly. Occasionally, you may have to tell someone they didn’t get the job, or that you’ve decided not to move forward on the project they proposed. Once you’re sure this is the case, if you can help it, don’t leave them in torturous suspense for weeks on end. My sincere apologies for the slow reply; I’d hoped to get back to you sooner. We very much enjoyed having you here for the job interview, as well as our conversation over lunch, but have decided to move forward with another candidate. Given your extensive credentials and sterling reputation, we’d love to keep you in mind for other positions that might open up in the future. I’d also be happy to refer you to others in the industry who might be hiring. Let me know if I can put you in touch. 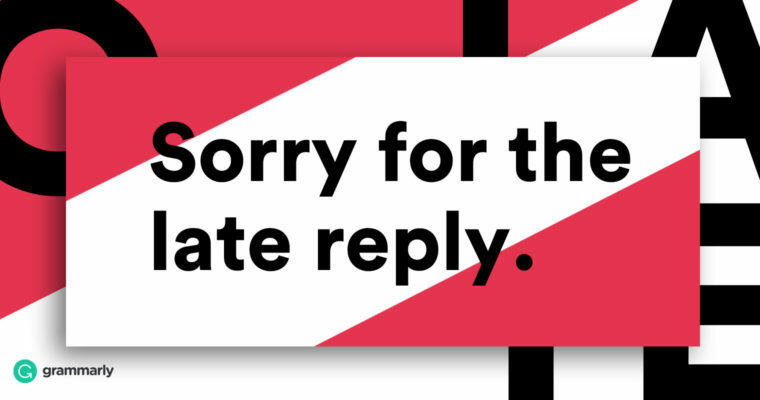 As ever, there’s not much use in belaboring how overdue your response is—own it, get to the point, and look for ways to make the recipient feel like they matter. In recent years, April 30th has become something like a holiday for chronic email procrastinators. Best known as “Email Debt Forgiveness Day,” it’s an annual free pass to finally send all those messages you’ve put off for way too long, without worrying about whether you seem rude or have a decent excuse. Then again, why wait until the end of April? Close out a few of those email obligations now, and you might feel better that much sooner.